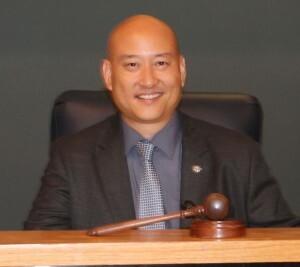 Outgoing Mayor Hans Liang made his farewell remarks during the August 5th Council Meeting. It is amazing that nine and one-half months have passed. It seems a very short time that goes by fast. He spoke about his experiences as mayor. It was a privilege to serve. He thanked the residents for allowing him to serve. He worked on policy development with public support. He thanked the department heads for their expertise. He stated the current Councilmembers now have terms limits of eight years. The staff and department heads will still be here for the next Councilmembers. He thanked the City Clerk’s office for their support. He thanked Vickie Banando, Executive Secretary for her work on the city’s policies. He thanked City Manager Paul Talbot and his department heads for their support. We made progress in the last nine and one-half months. The Council and city are at a good place. We don’t always agree but we work together. It is hard to gauge your efforts as mayor while serving. He thanked the public for their words of support. He thanked them for their affirmation that he is on the right track. Mayor Liang remembered Crossing Guard Abel Castellanos, who died in a traffic accident. A tree at Elder Park is a living memorial to him. He also remembered Joan Merino, a longtime volunteer, who served on the Library Board of Trustees. 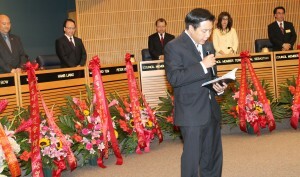 As mayor he remember all of the residents of Monterey Park. The residents support the city. Our community should be put first. For the last nine and one-half months he represented the city. Mayor Liang thanked his wife, Lani Liang for her love and support. Mayor Hans Liang, Mayor Pro Tem Peter Chan, Councilmembers Mitch Ing, Teresa Real Sebastian and Stephen Lam were joined on the dais by Assistant City Manager Ron Bow and Assistant City Attorney Karl Berger for the August 18th Special Meeting to rotate the Council. 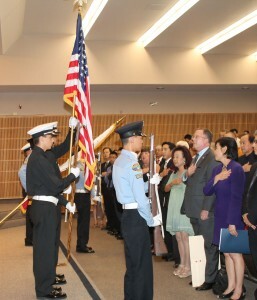 Mayor Liang called the meeting to order and led our flag salute. Members of the Monterey Park Police and Fire Explorers presented the colors. Nicole Ruiz sang our National Anthem to a packed chamber. She is a student at Mark Keppel High School. Pastor Albert Hung from Trinity Church led the invocation. He asked God to bless the people and give the gift of leadership to the Council. 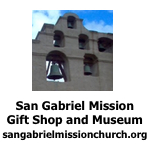 Grant them wisdom to help the people of Monterey Park and the United States of America. City Clerk Vince Chang called the roll. The Council voted to designate Peter Chan as Mayor and Mitch Ing as Mayor Pro Tem. Trustee Mike Eng welcomed the audience to this special event. He introduced special guests that included Congressmember Judy Chu, former Mayors David Lau, Betty Tom Chu, Anthony Wong, Rita Valenzuela and Lily Lee Chen, former City Clerk Dave Barron, Alhambra School Boardmember Adele Andrede-Stadler, Garvey School Boardmember Henry Lo, former Alhambra School Boardmember Sophie Wong, representatives from Peoples Republic of China and Taipei Culture Center, representatives from Supervisor Hilda Solis’ office, Assemblymember Ed Chau’s office and Senator Ed Hernandez’ office. 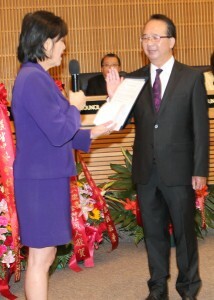 Former Mayor Betty Tom Chu administered the oath of office to Mitch Ing in the presence of his wife, Gloria Ing and their son, Derek Ing. Their daughter is attending college in Virginia. Mrs. Chu recalled that she and her husband, Bob Chu have know their family for many years. Mayor Pro Tem Ing said that tomorrow he and Gloria would celebrate their 26th Anniversary. He said that Betty and Bob Chu have been their role model. 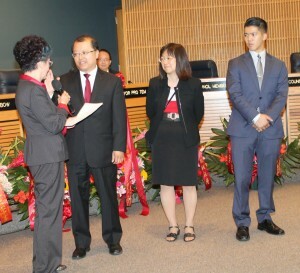 Congressmember Judy Chu administered the oath of office to Mayor Peter Chan in the presence of his wife, Jenny Chan and their sons, Kevin and Brian Chan. Congressmember Chu recalled that she has known Peter Chan for 30 years. He developed their Neighborhood Watch Program after several robberies in their area. 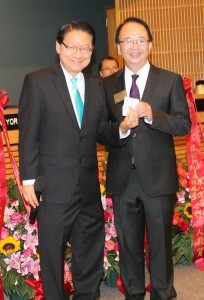 Peter Chan helped raise funds for the Monterey Park Bruggemeyer Library. He has served as a Trustee and a Foundation Member for our library. He worked on the city’s Blue Ribbon Budget Committee and the Fire Citizens Committee. He has currently served on the City Council for the last three years. He is a problem solver. He will be an outstanding Mayor for Monterey Park. 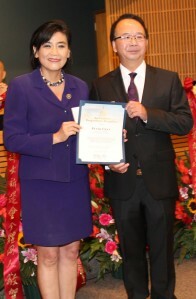 Congressmember Judy Chu presented Mayor Peter Chan with a proclamation. 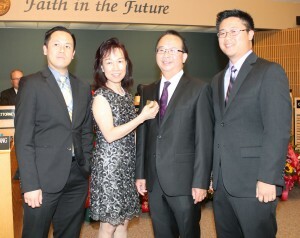 Mayor Peter Chan received his Mayor’s badge from Jenny, Kevin and Brian Chan. 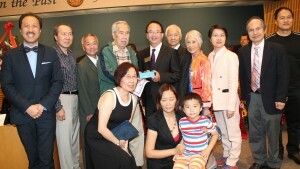 Members of the Chan and Ng families presented Mayor Peter Chan with his new business cards. Some of his family members traveled from Hong Kong to celebrate this special event. Some of the Ng family members have changed their last name to Eng. Mayor Peter Chan received his gavel from many of his former classmates from La Salle College in Hong Kong. These members all live in California. They were delighted to share the honor with Peter Chan. Master of Ceremony Mike Eng spoke about his friend, Peter Chan. He said that Peter Chan would watch over the city of Monterey Park. Mayor Peter Chan thanked all of his supporters. He thanked Congressmember Judy Chu, Trustee Mike Eng, Mayor Pro Tem Mitch Ing, Councilmembers Hans Liang, Teresa Real Sebastian and Stephen Lam. He thanked City Manager Paul Talbot, the department heads and staff. He thanked the residents for their support. He thanked the elected officials for their support. 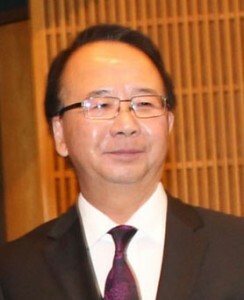 He thanked his sons, Kevin and Brian Chan. He thanked his wife, Jenny Chan. Monterey Park is known for its culture and respect. The city was incorporated in 1916 by a vote of 455 to 33. Our motto is Pride in the Past and Faith in the Future. We share many cultures and languages. It is important that we are not a static city. He spoke about increased revenues, the future of the city with three hotels and our strong Police and Fire Department. The Market Place will be built in the future. We have a balanced budget. The City Hall is opened five days a week. We celebrate many events in the city with the public. We are planning our Centennial for 2016. He is proud to be a Monterey Park resident. He has an open door policy to listen to the concerns of the residents. The city works best when we work together. In the next hundred years the residents will say with pride “I am from Monterey Park”. Outgoing Mayor Hans Liang received proclamations from Senator Ed Hernandez, Assemblymember Ed Chau, the Alhambra School District, the San Gabriel Valley Entrepreneur Lions Club, the Rotary Club, Congressmember Judy Chu, the Democratic Club and Trustee Mike Eng. 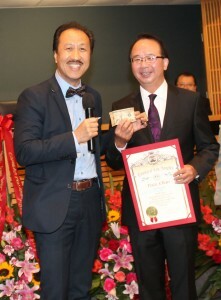 Mayor Peter Chan received a money gift from his brother-in-law, Councilmember Ed Eng from the city of La Mirada. Mayor Chan adjourned the meeting. Many elected officials, civic groups and supporters congratulating him on being the new Mayor of Monterey Park with proclamations.